The term "cellulite" describes the unsightly dimpled skin of buttocks, lower abdomen and thighs caused by fatty deposits deep under the skin. Fat Girl Slim is a cream by Bliss Spa that markets itself as an anti-cellulite treatment. The shame of most cellulite treatments, including Fat Girl Slim, is they simply do not work. In order to ease the cost and time of personal experimentation, we have put together a panel of reviewers to try the most prominent cellulite creams on the market. Our reviews look at the effectiveness of the product, value, and any risks associated. Our ratings show you which cream works the best for the money. Hint: it's not Fat Girl Slim. What is Fat Girl Slim? We tried finding out which celebs actually endorse this product, but we just couldn't find any. The mere fact of the false claim of celebrity endorsements makes the other claims suspect but we went on with our reviews, hoping to be surprised. Fat Girl Slim uses caffeine for its cellulite-reducing properties; for this Fat Girl Slim can be applauded. However while caffeine is an effective anti-cellulite ingredient, it must be used with the proper combination of supporting ingredients, and this is where Fat Girl Slim fails. Caprylic triglycerides - a fat used to make biodiesel and is linked to heart disease and high blood pressure. PEG-12 distearate - used in some products for damaged skin but its use is restricted because it is often contaminated and may cause organ toxicity. Cyclomethicone - a fancy name for silicone, abundant in personal care products. Glyceryl stearate - an emulsifier. Sodium benzoate - a preservative in some cough syrups that may cause cancer when combined with vitamin C.
Butylene glycol - a solvent that may cause liver damage. Bupleurum falcatum root extract - used as a liver tonic in ancient Chinese medicine. Coenzyme A - assists in transferring fatty acids within cells but no evidence supports it's absorption through the skin. Dimethicone - a lubricant that is an important ingredient of Silly Putty. Methylisothiazolinone - a strong antimicrobial agent recently linked to brain damage. 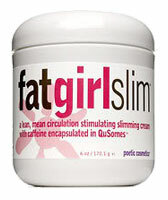 Fat Girl Slim is sold online through the official Bliss website and other online retail sites such as Amazon.com. A 6 oz jar sells for $29 or you can buy a 4-jar set discounted at $104. Bliss offers no free trials of Fat Girl Slim and no policy for returns or warranties are specified. Although Fat Girl Slim boasts a 73% success rate online, we're not sure where these numbers came from because we did not experience such a large rate ourselves, and from reading consumer reviews of Fat Girl Slim, a majority of users didn't experience this success either. While the caffeine in Fat Girl Slim had some effect, it was minimal and the cream had too many chemical additives for our liking. There are more effective and natural anti cellulite products out there that can provide better results for your dollar - and we have found which one works best. To find out which cellulite cream worked best check out other cellulite cream reviews.